Shares rallied 10% before Tuesday’s opening bell. 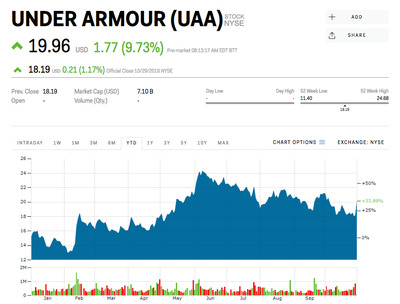 Under Armour is rallying before Tuesday’s opening bell – up 10% – after the company beat on third-quarter profits and raised its full-year guidance. The sporting-apparel maker earned an adjusted $US0.25 a share – $US0.12 higher than what analysts surveyed by Bloomberg were expecting. Revenue was $US1.4 billion, just missing the $US1.42 billion that was anticipated. “Our third quarter results demonstrate that our multi-year transformation is on track,” said CEOKevin Plank in a press release. Looking ahead, the company lifted its full-year guidance and now sees adjusted earnings per share to be in the range of $US0.19 to $US0.22, up from the previous expectation of $US0.16 to $US0.19.